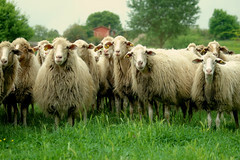 Widow’s Christian Place: How "Sheepish" Are You? I love how the high, lofty things like glory for ever and ever and the eternal covenant and the God of peace all come to rest in the person and work of the Lord Jesus, the Great Shepherd of the sheep. Sometimes it's comical to me to think of myself as a sheep, and ludicrous that I could do His will and please Him. But it's true! He’s the Shepherd, we’re the sheep; He equips us to do His will and to please Him, even in the pasture time of widowhood. I imagine myself as one of these critters pictured here. Pretty soon my sheepish self might be wearing an apron and holding a spoon and mixing bowl—I sometimes like to cook a week's worth of food on Saturdays. But for now my little sheep needs to lie down and stretch out for a few moments of nothing but feeling a gentle breeze and the Good Shepherd's love and care, as in "He maketh me lie down in green pastures . . ." Psalm 23.
laying down in the green pastures part! May God's love and care give you rest this weekend.